Perhaps it’s just me but I’m feeling a bit nostalgic! Drinking fountains are making a comeback! Or at least they are in the University of Sheffield. 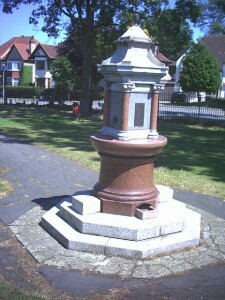 The very sight of a drinking fountain reminds me of hot days in London, playing football until it’s well past tea-time, then running home (how did we have the energy) and stopping en route to slurp from a drinking fountain. In my case it wasn’t a beautiful work of art like the picture, rather a spartan, stainless steel job that seemed to make the water taste metallic. But I’m sure that was my imagination. But it was cold and it quenched our thirst. Oh, glory days. Nothing to worry about except whether the sun was shining. I suspect there was plenty to worry about but advancing years have provided me with rose-tinted spectacles to observe all things from my youth. Sorry – day-dreaming over – back to 2012. The Student Union at Sheffield University (SUSU) have been looking with an environmental eye at the amount of plastic used in the bottling of fresh water. Their logic seems valid: compare all the costs (financial and environmental) of students buying water in bottles – with the costs of providing free water from drinking fountains and you get a no-brainer result. Drinking fountains win hands down – and, these days, the hygiene considerations are far greater than when I was slurping freely in the 60s. So SUSU has installed fountains around the University and, as the water is provided free of charge, they are encouraging students to drop a few pence into a collection box close to the fountain. Every so often the boxes will be emptied and the contents donated to a water charity that provides clean drinking water in the developing world. It is an admirable scheme and SUSU ought to be congratulated for their initiative. You might be wondering how we know about this. TASTE is one of two charities nominated to receive the contents of these collection boxes during the next 15 months. So, don’t forget Sheffield Uni students – when you drink from the fountain, remember to leave a small donation!